The OB Rag is performing this public education service as the OB Planning Board is having its annual election on March 2nd. 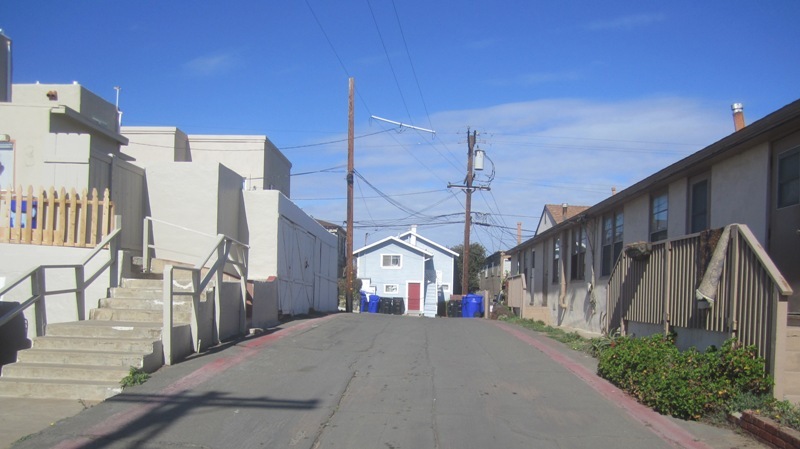 And we feel that development issues are coming to the fore once again in OB’s history, as funds bottled up during the Great Recession are being unleashed and the village is facing multiple pressures – and in fact, is at a development crossroads. 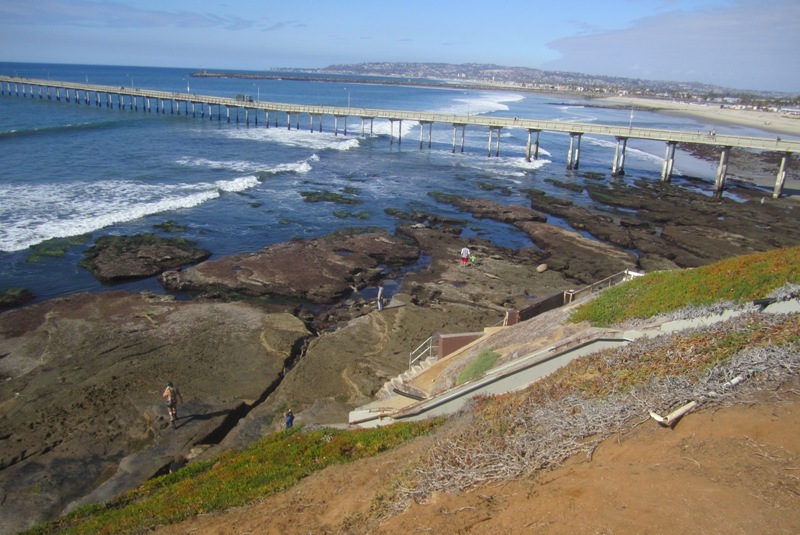 The fifth district within OB is the smallest district geographically, but because it hugs the gorgeous Sunset Cliffs, it has some of the most stunning views of sunsets, the coast, the surf, and provides an aura of solitude at those cliffs. 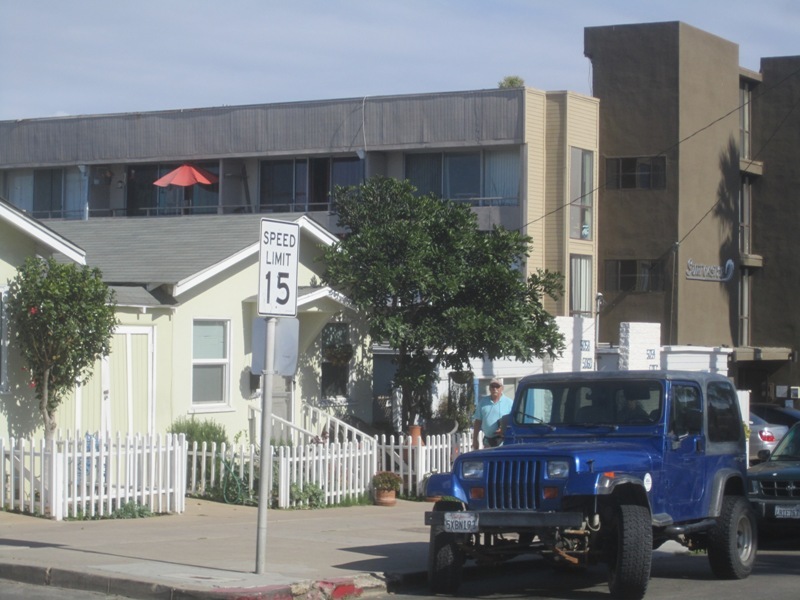 Only about two blocks deep from the cliffs, the district includes approximately 8 blocks of residences – and is one of the most highly impacted areas of OB in terms of density. Mainly residential, with many apartments, the district does include those businesses along Niagara Avenue and along Bacon and Cable Streets. 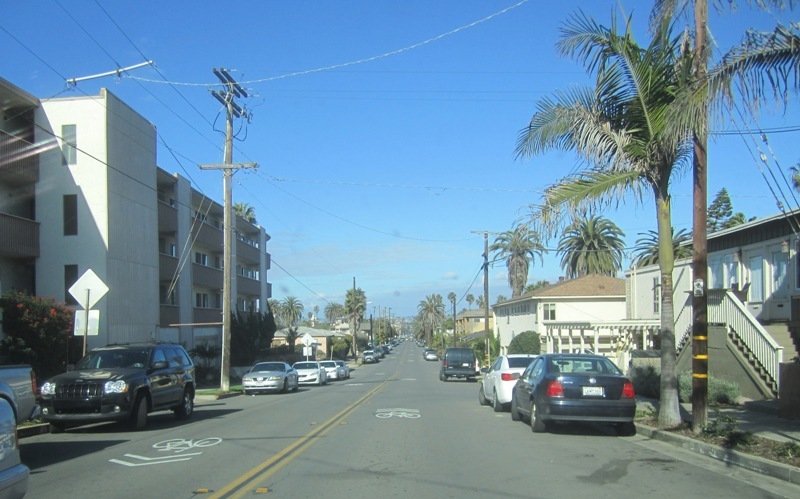 The district’s boundaries include the alley between Newport and Niagara on the north side, Cable Street on the east side, the alley between Coronado and Del Mar Avenues on the south side, and of course, the Cliffs on its western edge. Niagara, Narragansett, Del Monte, Santa Cruz and Coronado avenues all traverse the area east and west, with Bacon and Cable interrupting the blocks of small houses and apartments with their north-south directions. 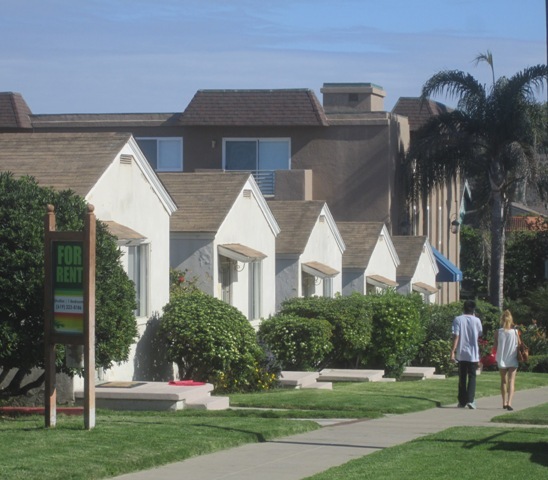 Due to the many apartments in the district, it has some of the highest density within the Village of OB. 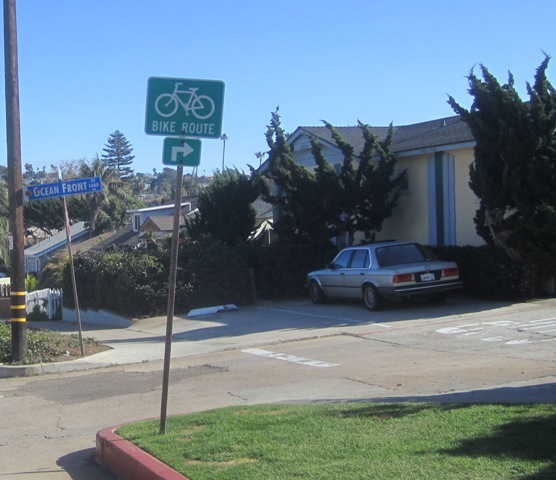 Along with the apartments come traffic congestion, curb cuts and parking issues. A number of large apartment complexes have been built right along the top of the cliffs, adding not only to the crowding but also stressing out the fragile cliffs themselves. 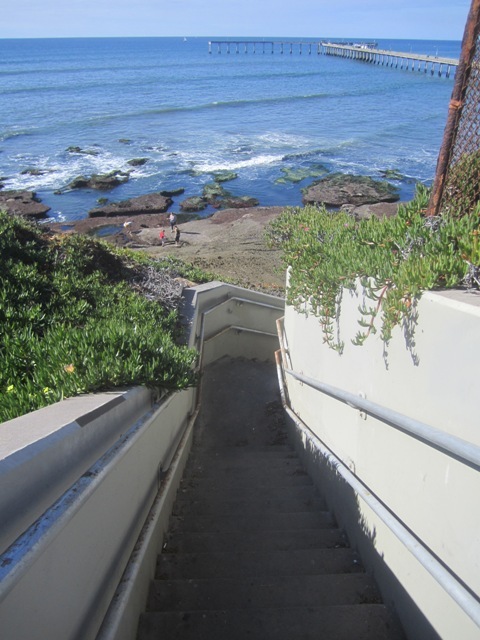 Other issues include those historic issues associated with the lack of public access to California’s coast, as many of the blocks along the cliffs are walled off due to all the buildings constructed right off the edges of the cliffs. 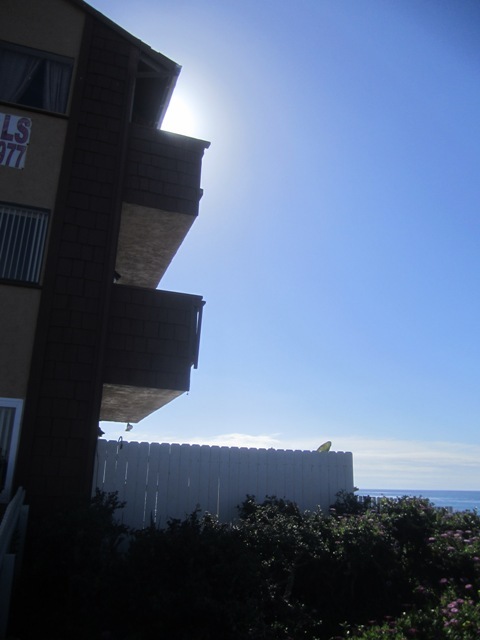 Scenic views of the ocean are prevented when this occurs. This district suffered horribly during the late Sixties and early Seventies as developers went crazy installing massive complexes during a period of unbridled construction – before the days of height limits and planning committees. 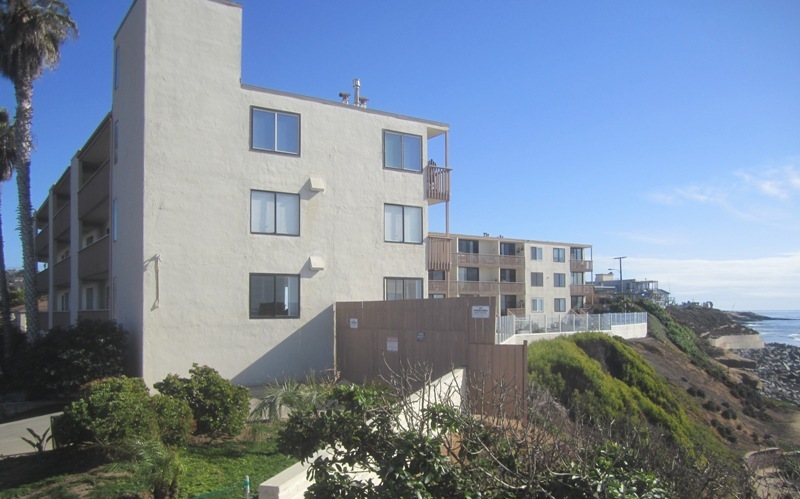 In fact, it was the building of apartments on the cliffs in this district that led to galvanizing the community to fight for more access to the ocean, more limits on development and on building heights, and to the creation of the OB Planning Board in the mid-1970’s. The planning crisis of the early Seventies was one of the key issues that challenged not only OB but the entire Southern California coast. One of the results was the passage of the popular grassroots initiative of the 30 foot height limit. Local residents have been grappling with the increased density by putting pressure on the city to install more and more stop signs at intersections within the district. How many stop signs residents will go along with has yet to be seen. Other issues: the continuing pressure from gentrification and now the potential of “loss of community” from short-term vacation rental companies like Airbnb. 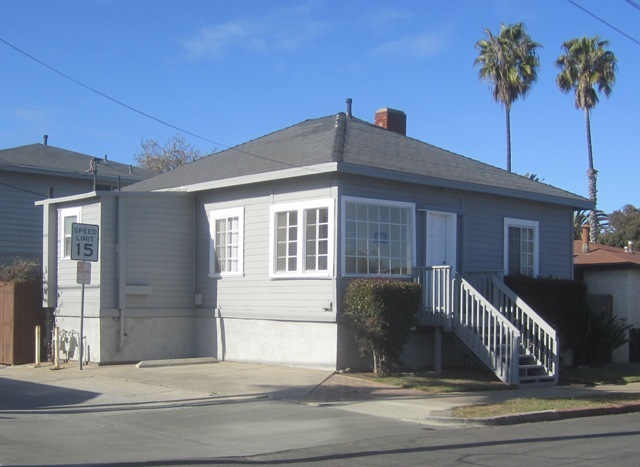 In the meantime, the area continues with a mix of cottages, small homes, new large 3 story rehabs, and the many apartments built over the decades. Saving these beautiful cliffs has always been a community goal. 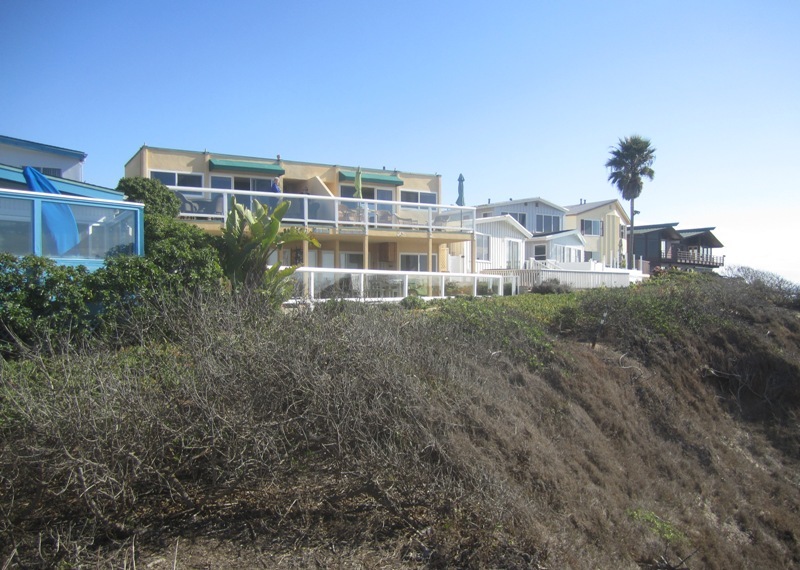 But the tension between individual property owners who have their homes or condos along the cliffs and those others within the community who wish to keep the cliffs pristine and “natural” has always been there. At times, it has been submerged. 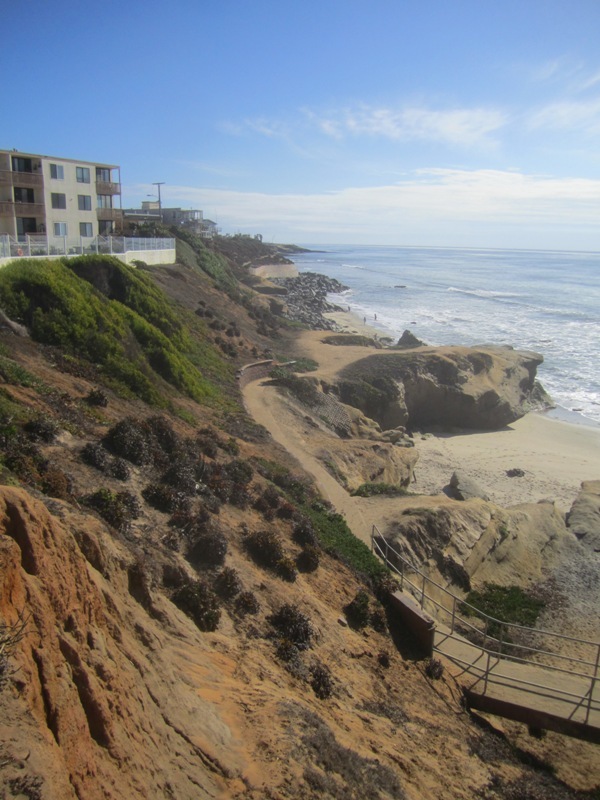 At other times, it comes roaring out and pressure is applied to the City to do something about the erosion of the cliffs. Usually the City responds by dropping massive boulders and rocks over the side in an unwitting attempt to halt the slide into dust and water. 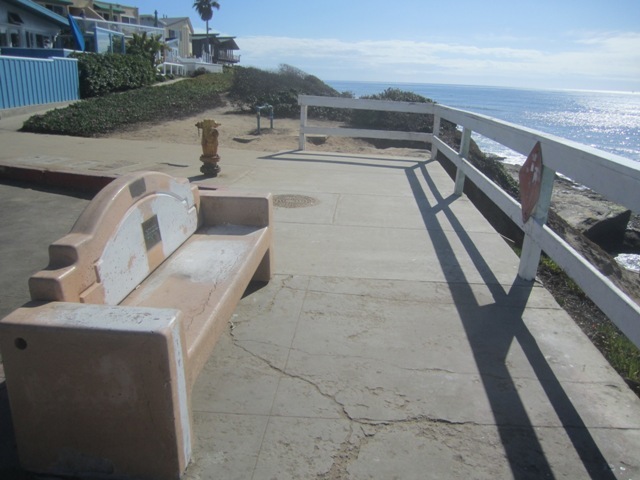 At other times, the property owners take matters into their own hands and construct their own barricades to the water, often putting in ugly concrete or blocks to shore up the cliff sides. Lately, there is a consciousness raising that views this type of abatement as overly extensive and goes against the tide of public opinion. 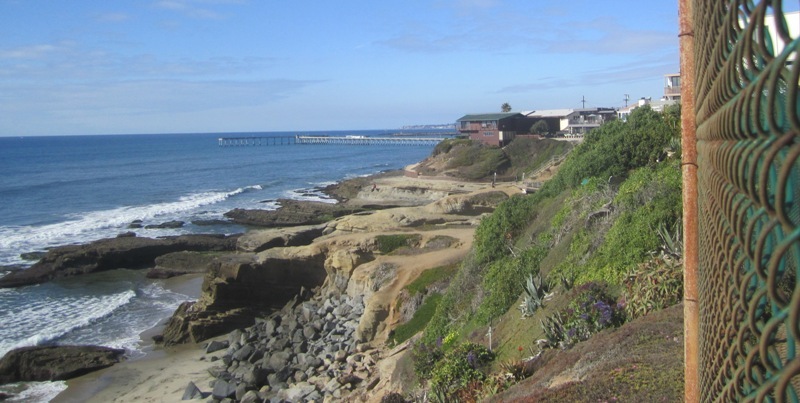 Many believe that Sunset Cliffs is a natural resource for the entire community – not to mention the rest of San Diego – to enjoy, and any alteration of their naked state is an insult against nature. 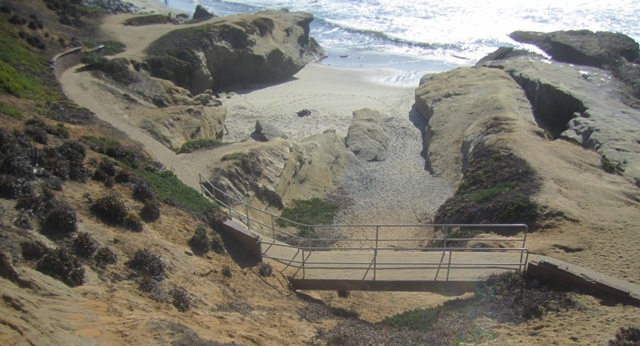 The Cliffs provide other challenges too; they are marked up with graffiti and people cutting into the hard sandstone, plus the trash and cigarette butts left behind. However, beautiful they are, their dangers have taken their toll on the unwary. 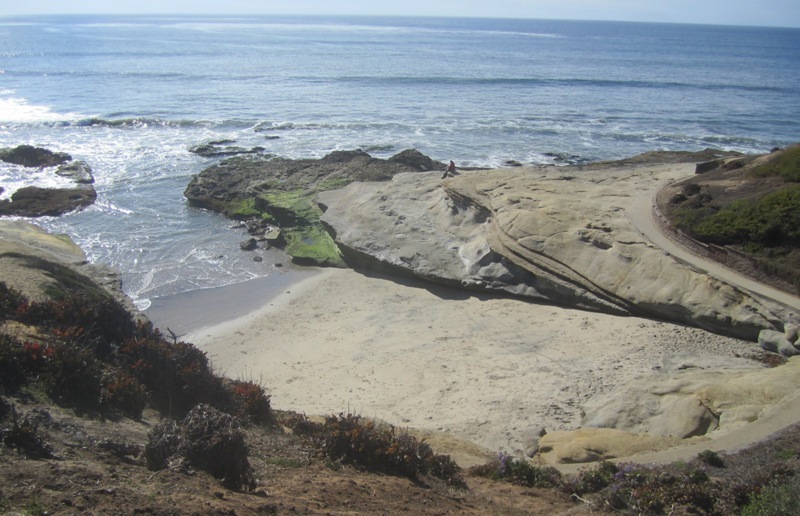 On a more positive side, along the cliffs are some of the most enjoyable pocket beaches in OB. 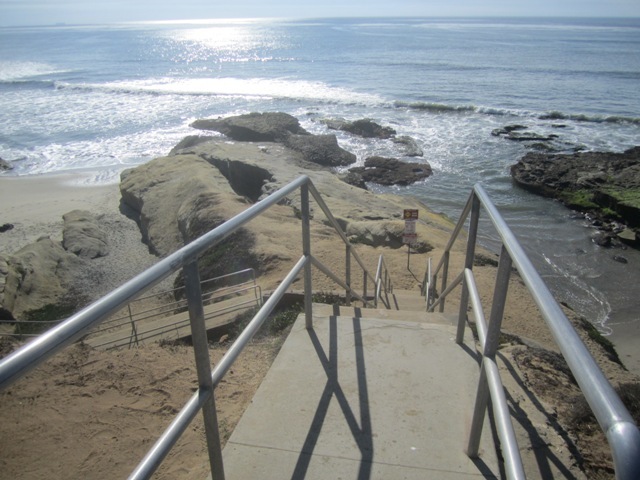 The rocks and beaches just off Santa Cruz Avenue provide some of the best areas to get away from the crowds over at Newport’s sandy stretches. 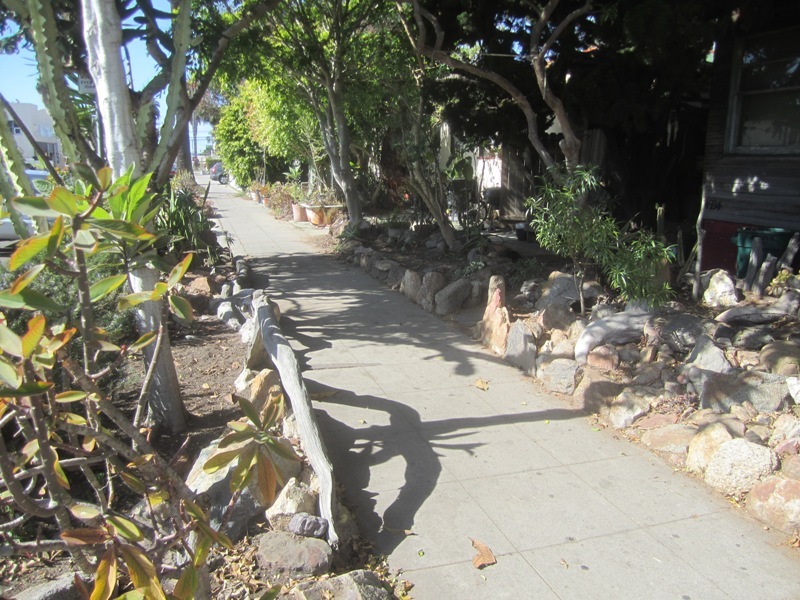 Also, there is OB’s great “Alley Bike Tour” through the back streets and allies of the district – a tour that takes you parallel to the cliffs. 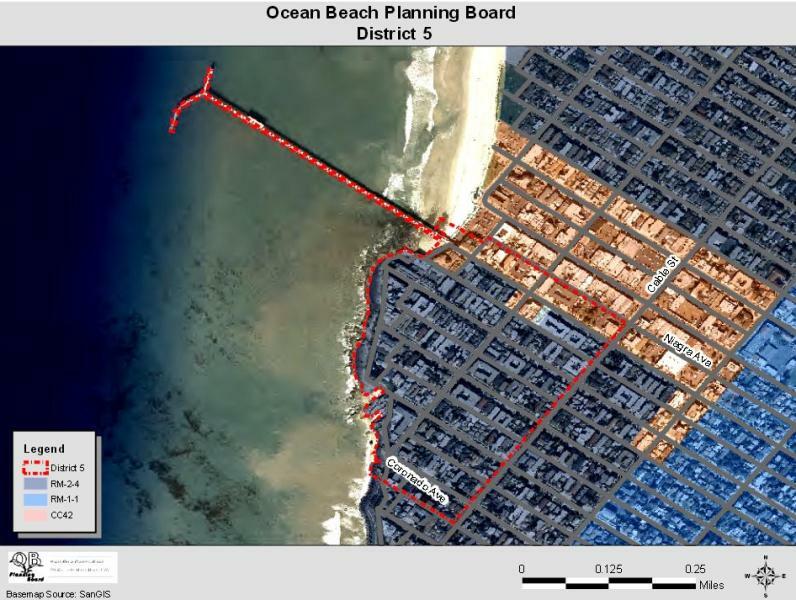 The district does include the OB Pier (but not the Pier parking lot). Patrons enjoy outside seating at Raglan along Niagara. 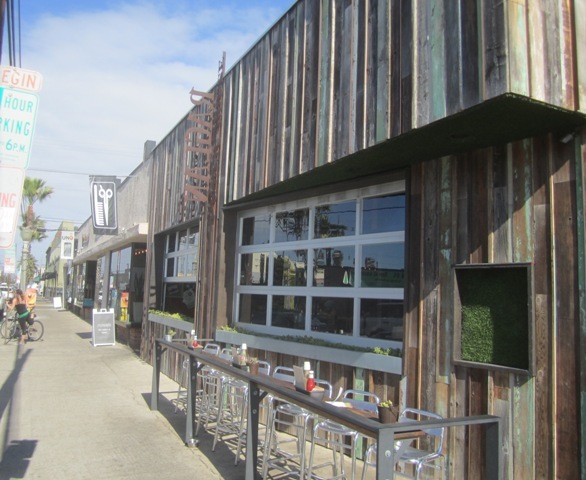 As noted, District 5 has some businesses as the commercial overflow from Newport has strengthened the influx of merchants on the connecting streets. From Union Bank down Niagara to the restaurants that dominate the intersection with Bacon, there has been a noticeable uptick of pedestrian traffic and use of those eateries by locals. OB’s oldest restaurants: Poma’s on the left and Nati’s across the street on the right. OB Noodle House is expanding here and hope to be open in a couple of weeks. 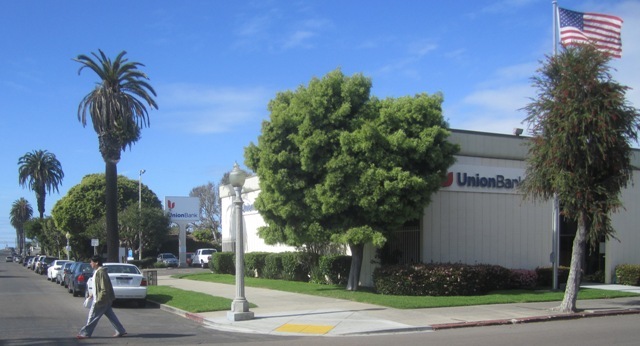 Yet from the corner to the alley along Bacon has seen a rejuvenation of commercial enterprises that has led to a substantial shoring up of that section of OB’s main business area. 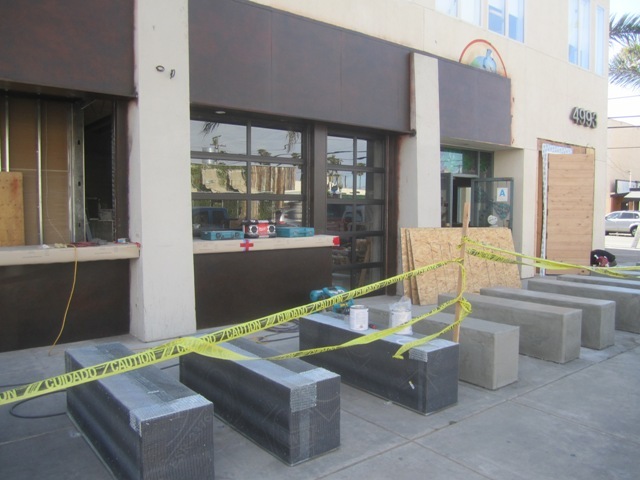 Outdoor seating has arrived, as restaurant owners and their patrons take back public space. 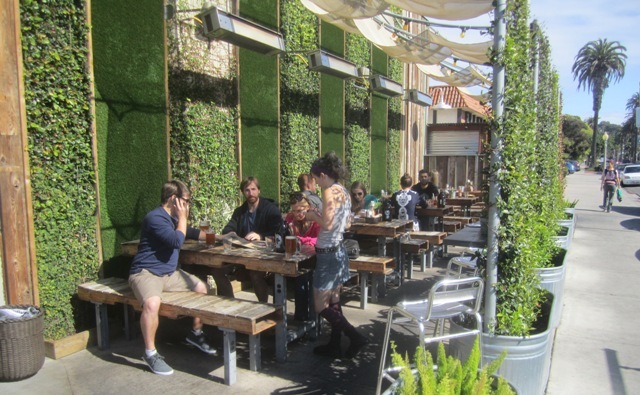 For decades, only Nati’s had outside seating – but now just about every other eatery has installed tables in the sunlight. 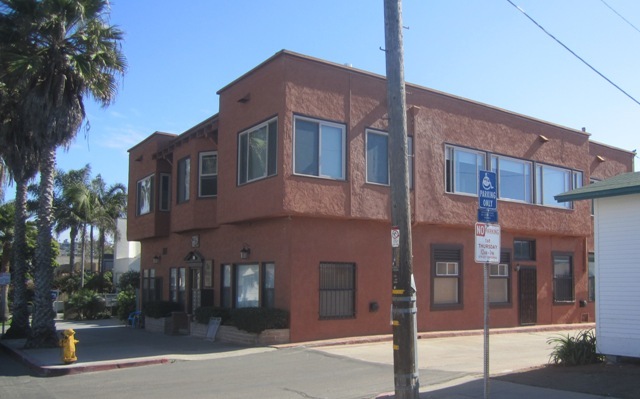 District 5 business area also includes the offices of the OB Mainstreet Association. District 5 is a very friendly neighborhood. 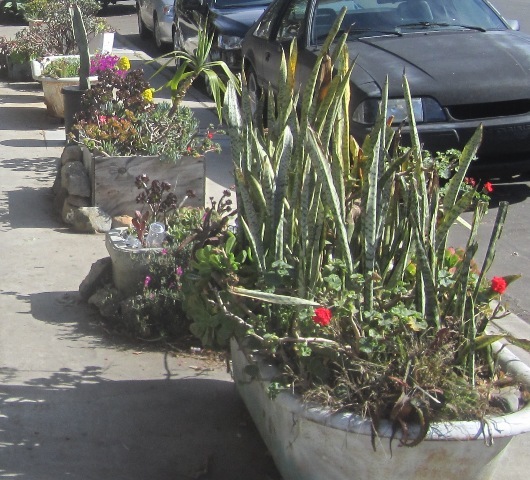 Locals have on occasion beautified the sidewalks and other public areas. Flowers in old bath tubs is a favorite. 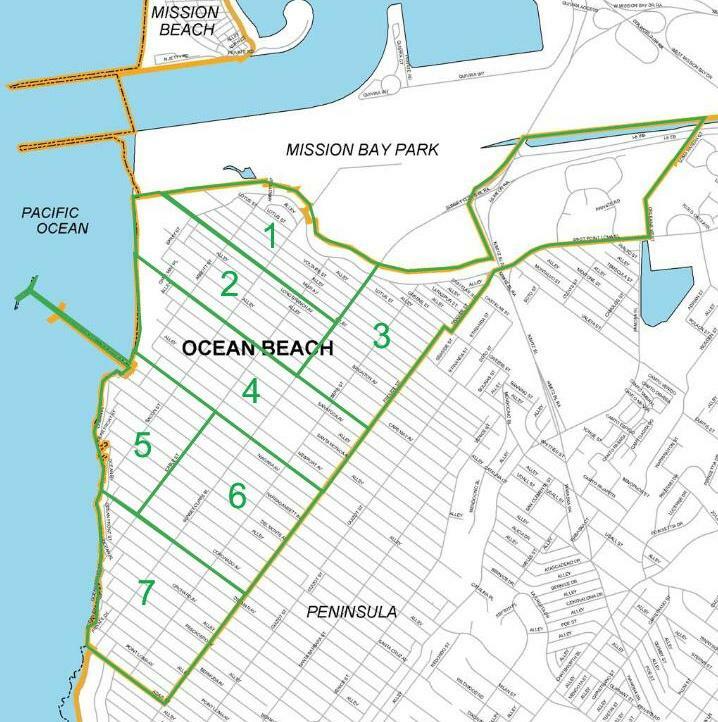 As with each of the districts, District 5 normally has two representatives on the OB Planning Board, but currently one seat is vacant. The other seat is held by veteran OB planner, Jane Gawronski, whose seat is up for grabs now. There is a candidate election on March 2nd. 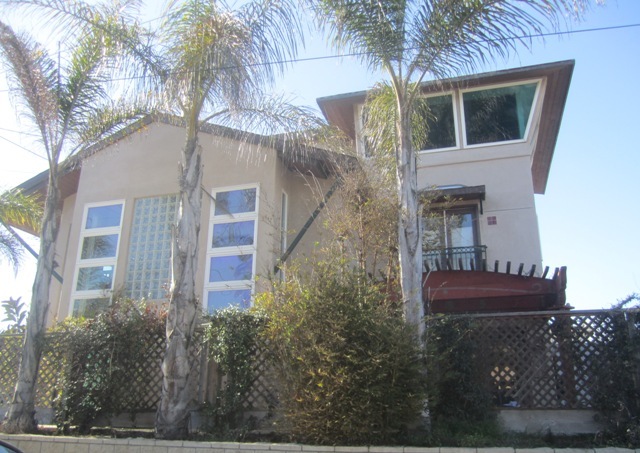 There are many great houses within this district, either old Craftsman homes upgraded or other houses demolished and rehabs taking their place. 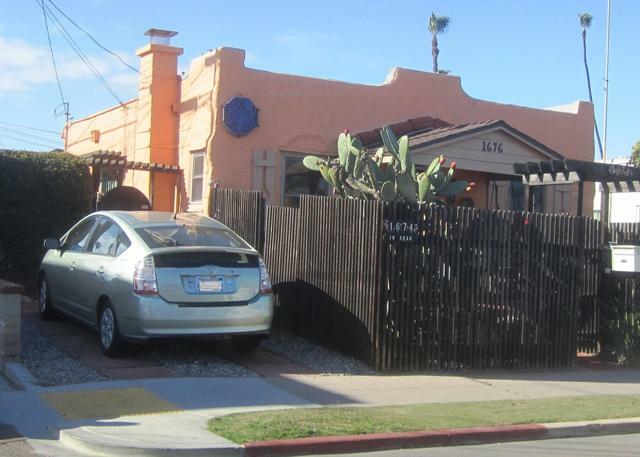 Neo-Spanish Revival architecture sits alongside 3-story mansions. The neighborhood remains very mixed however. 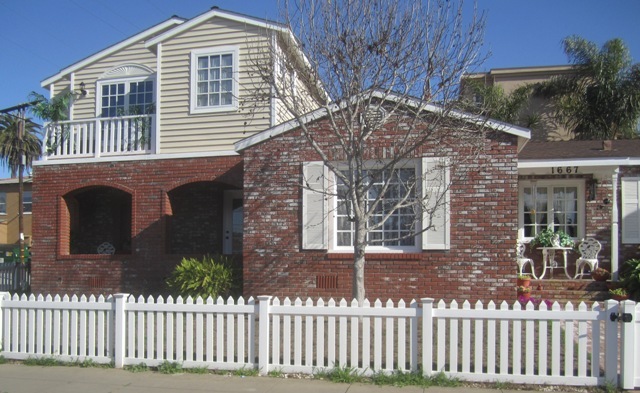 A number of new large homes have been built, including this 3-story that looks way out of place. Certainly does not conform to bulk and scale of the immediate neighborhood. 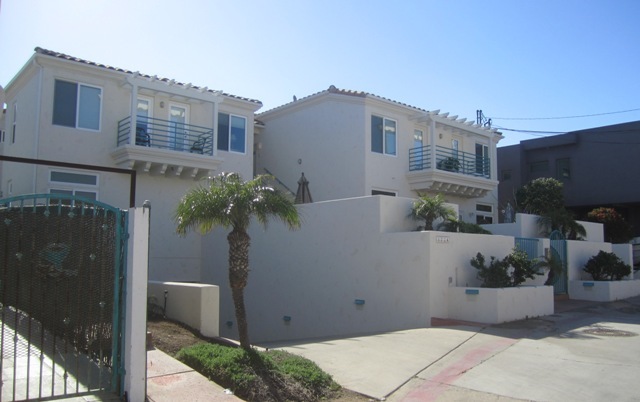 These condos wiped out a local neighborhood volley ball area when built. 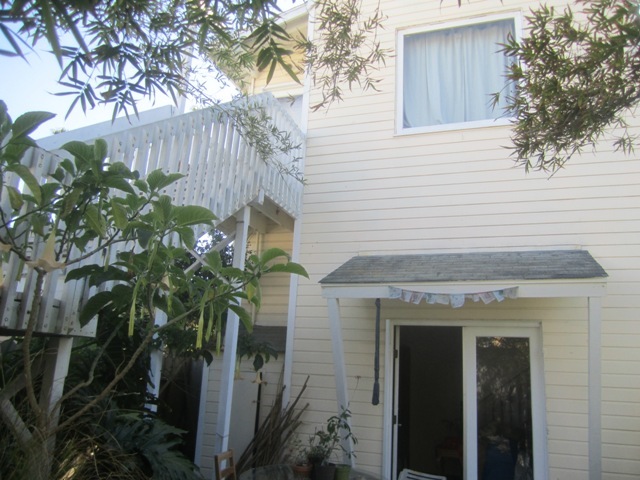 Notice the under-grounding of the garages – and this complex is but a few yards from the cliffs. Once in a while, a housing developer constructs something out of the ordinary. 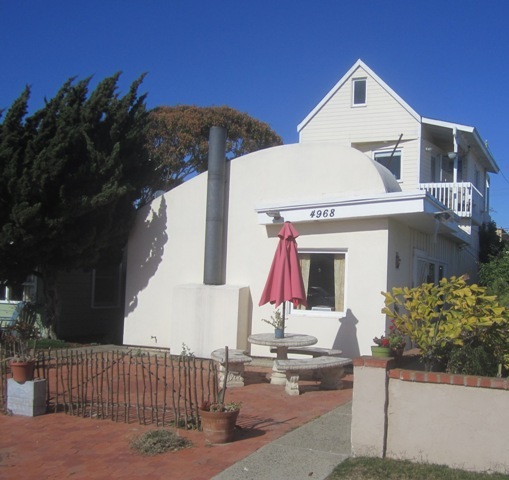 On the 4900 block of Santa Cruz Avenue stands such a wonder. When originally built, this two-story building consisted of 3 different architectural styles – each painted a different pastel color. 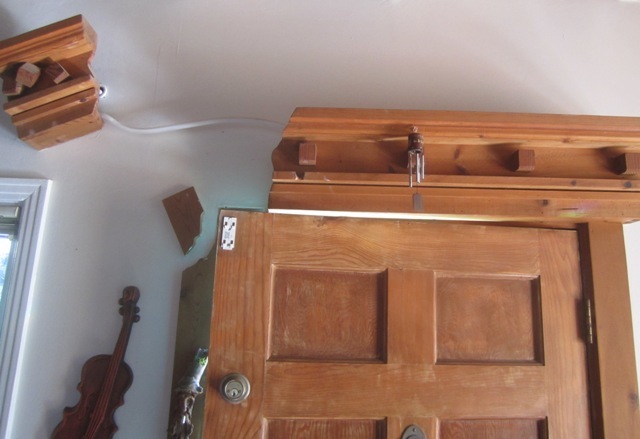 Mike – the current resident of the front unit – allowed me inside to take photos of the house’s curiosities and landmarks. 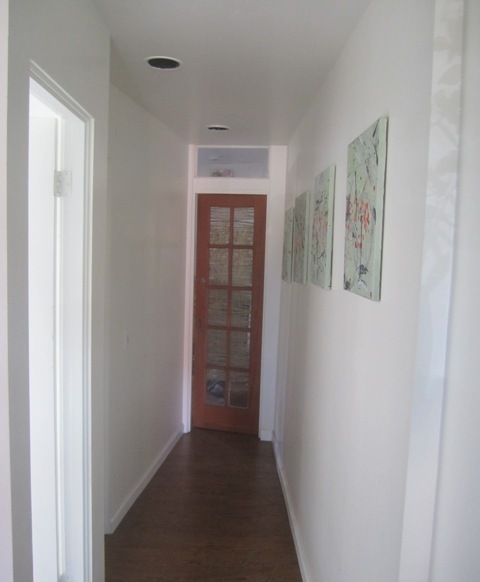 The disappearing hallway -notice how it narrows as it approaches the door. 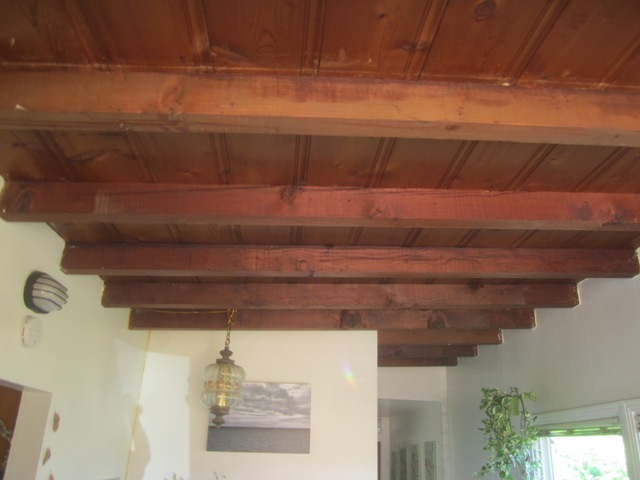 The builder certainly had fun constructing the interior. Look at this front door. Back of building. The stairs lead up to the 2nd unit. Join me in a walk around the district, taking in the sights and contradictions. New paint on one of OB’s oldest standing apartments. Another house along Bacon that does not match neighborhood standards. 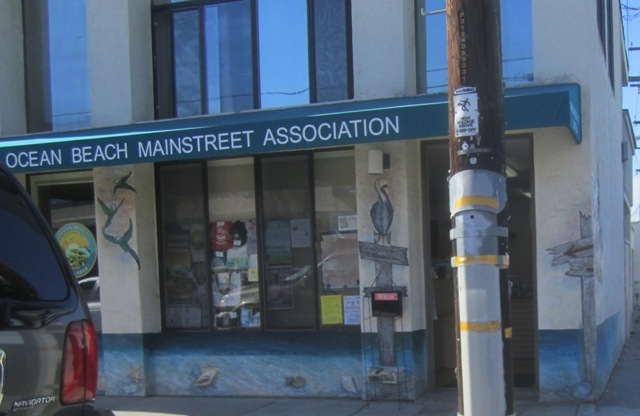 The offices of the OB Mainstreet Association. 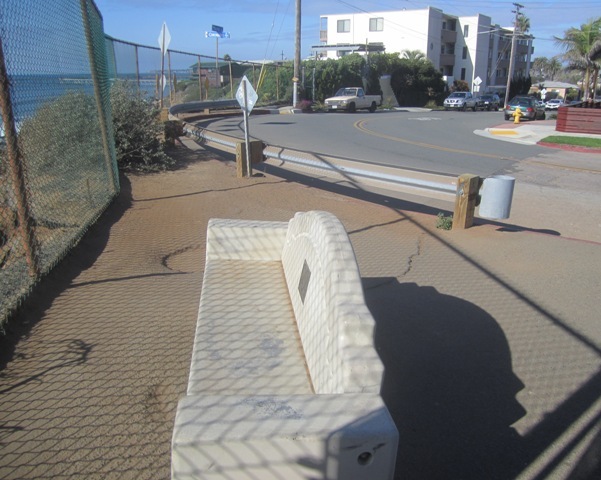 Foot of Del Monte Ave allows for some scenic viewing. Cost: Priceless. 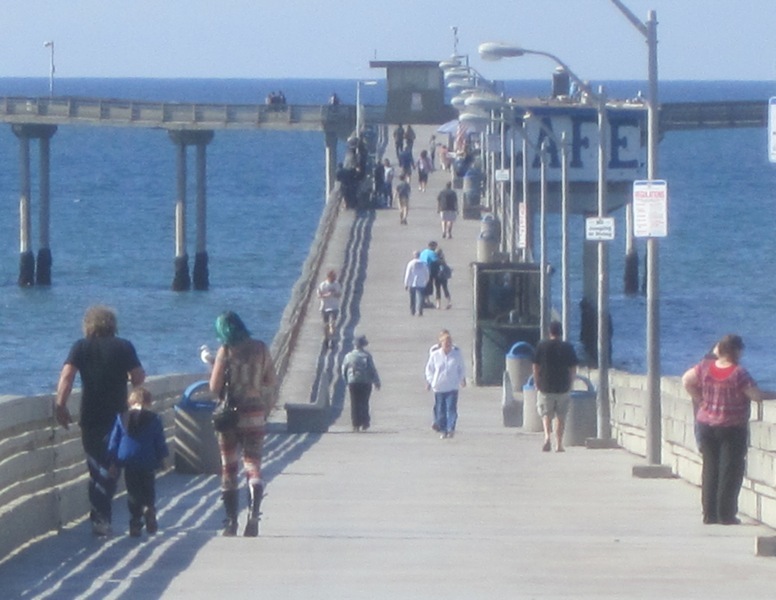 as well as Reggae on the OB Pier in 1993. 25th anniversary of both events. would you want to do a story about those. I have photos and memorabilia. I also was the director of Camp Ecology run on the beaches of OB. 1994.